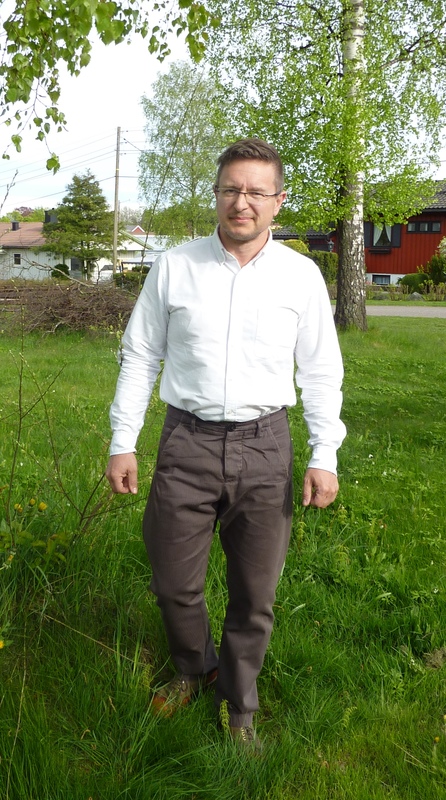 Trouser Tuesday: Hansen Garments "Sverre", trousers with a singular seam - Well Dressed Dad - It is a proper menswear blog. Like, with original words and opinions and suchlike. Today’s instalment of Trouser Tuesday takes us to Copenhagen, home of Hansen Garments. I’ll admit right now that Hansen make some of my very favourite trousers and I have several pairs in my trouser rotation already. There is always something subtly different about Hansen’s trousers, something that give them that little something, that makes them actually discussable. Today’s pair are a good example of this. 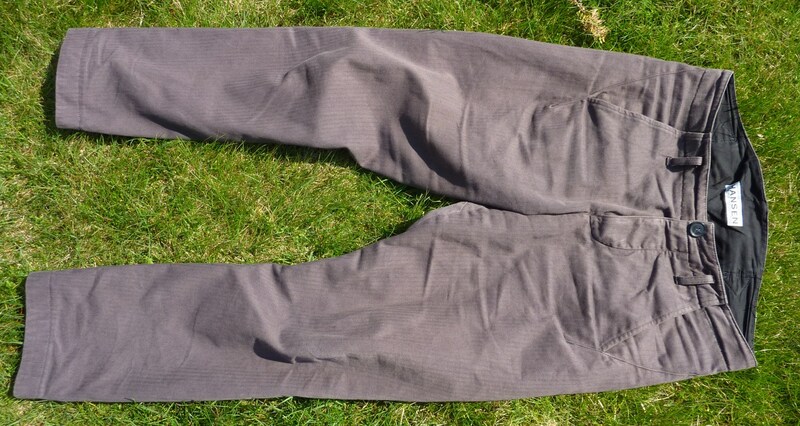 As is the way of Hansen, all trousers types are given a Scandinavian boys name, and these are the “Sverre” style. Usually available from season to season in various fabrics, I think these in a brown herringbone cotton were AW12. Hard to say, as they are wearing very well, after lots of use and a few washes. A testament to their quality. Style-wise these trousers have retro styling cues, with a high rear rise, roomy around the thighs and quite tapered legs. A fit that works very well for me, as I appreciate a decent amount of coverage at the back when cycling, and the leg taper means bicycle clips are not necessary. Practical and with purpose. 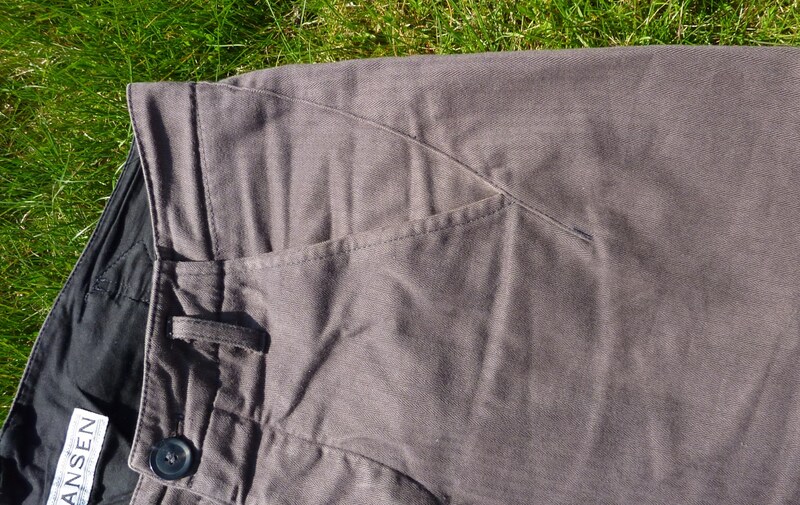 So what makes these trousers different from most other cotton twill trousers? The devil is said to be in the details, and these have some details more obvious than others. For starters the pockets are distinctive. Comprised of two curved seams creating a pleasing geometrical pattern. The opening seam running all the way up to the waistline, and down to intersect with the other seam running a couple of inches down below the opening. The rear has a proper working rear cinch, which allows the trousers to be worn with or without a belt. The hardware is actually good enough to allow the cinch to stay tight. The waist is nice and high, so the trousers sit properly over the hips, as men’s trousers should. The fly is of the button-type with a fly-guard, well-made so it both closes well and looks good. The fly buttons are distinctive metal buttons, which is a nice touch. 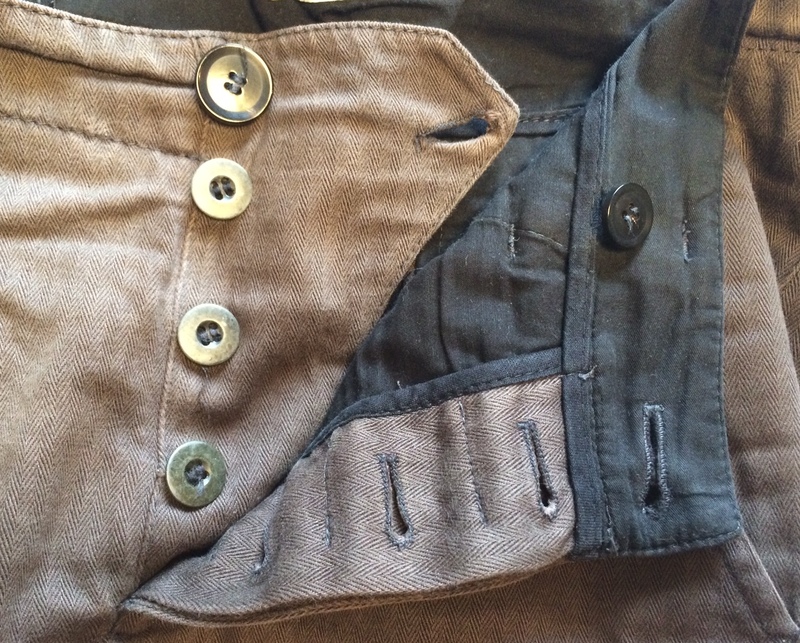 The closing button and pocket buttons are of real horn, as visible buttons ideally should be. The most unusual feature though is one that is not immediately noticed, though once you’ve seen it you wonder why more trousers are not like this. Notice the outer leg seam? No? Of course you don’t, as there isn’t one. Pretty clever. 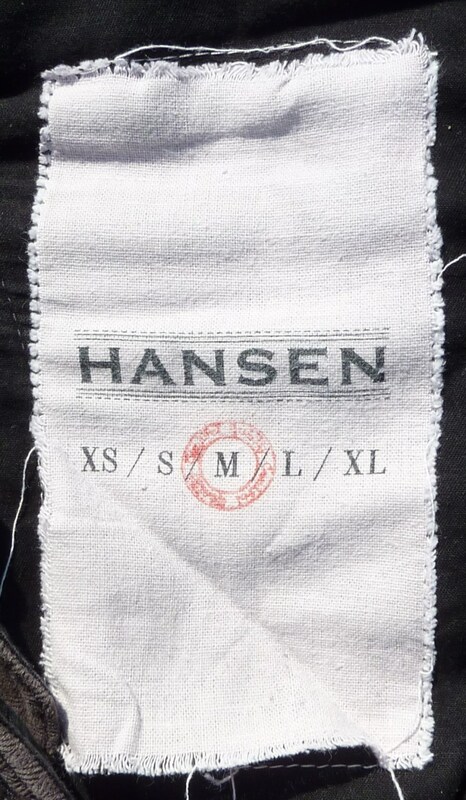 Hansen pay a lot of attention to the fabric used for their garments. Often going for the better fabrics at higher cost than saving on the expense and going for the lesser quality. As mentioned, I’ve used these a lot over the past couple of years, with probably half a dozen washes, and the material still looks and feels superb. Possibly even better than when new. And I just adore the herringbone pattern. It brings things to life in a way regularly woven fabric just doesn’t. Another one of the small Hansen-touches are the labels inside the garments. Of a single type, printed on cotton fabric and hand-stamped to signify sizing. Price wise Hansen Garments tend to be a little above average, but considering the low production numbers, the design and quality, I consider them to be excellent value for money. Being outside of the fashion stream also means they’re never in or out of fashion, but always excellent style. Marked as medium, measured to 36″ (with cinch slack, after multiple washings, so size is stabilised). The label inside label has comprehensive instructions for washing. 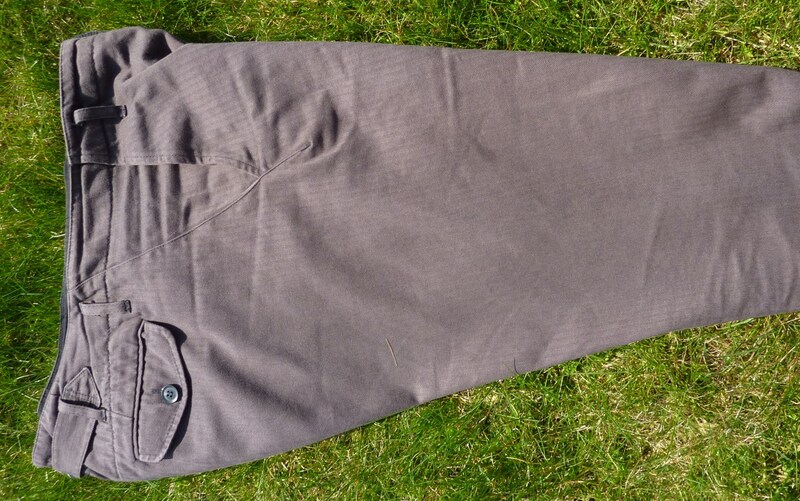 As is appropriate for 100% cotton trousers, you can’t go wrong at a regular 40 degree colour wash.